Doh! If you are going to try to fool Japanese people, it's very important not to make simple Japanese language fails. Two of the biggest Japanese beer brands are Asahi and Kirin. According to 47 News, a 44 year-old Chinese national was recently arrested in Tokyo after it was discovered he was allegedly importing phoney beer gift certificates. 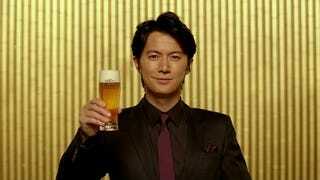 In total, there were 2,500 faux beer vouchers seized, worth 1.9 million yen (US$18,800). Beer gift certificates are bought as gifts and can be exchanged for actual alcohol. The suspect has denied knowing that there were counterfeit beer tickets in the package, which was sent from China. The seized fakes looked quite real, right down to the security hologram. Shame, because the counterfeiters totally screwed up the beer's spelling. In Japanese, "Asahi" is written as アサヒ (literally, "Asahi"). It appears on various Asahi beer cans as well as the beer company's website. Yet, the fake beer gift certificates read "Asabi" (アサビ) in Japanese, with "bi" (ビ) substituted for "hi" (ヒ). These are not confused by Japanese people. So... whoops! Yet, the counterfeit tickets read "キリソ" (or "Kiriso"), mixing up the katakana character for "so" (ソ) with the character for "n" (ン). Likewise, these are not confused by Japanese people and instantly stick out as incredibly strange. It's like seeing a watch that says "Rulex" or "Rolix" instead of "Rolex." The oddest part is that if you simply type Asahi into a computer when it's set to the katakana syllabary, you get アサヒ. And Kirin is キリン. You cannot screw it up. Scratch that. It seems you can.